Economists challenge a politicians’ truism. Kenneth Mandile strolls across his factory floor, a converted mattress warehouse churning out precision parts for everything from endoscopes to guns. The factory in the central Massachusetts town of Oxford is purring loudly this afternoon, but Mandile, who is the president and owner of Swissturn/USA, has his concerns. The comment briefly sent the world of economics atwitter. Though a veteran of Democratic administrations, Summers is hardly a darling of the left. And it is liberal economists like New York Times columnist Paul Krugman who have raised the most pointed questions about the skills gap. The theory, they say, unfairly blames American workers for economic malaise and distracts from the hard work of reshaping an economy skewed to the 1 percent: stimulating the economy, raising the minimum wage, strengthening unions, crafting worker-friendly trade deals. Whatever their ideology, skills gap skeptics say plenty of hard data support their view. If there was truly a shortage of skilled factory workers, the argument goes, employers would be raising wages to attract people who could do the job. But national data show pay is rising no faster for industrial engineers than for less-skilled workers. The naysayers also point to a Boston Consulting Group report from 2013 estimating the country is short 80,000 to 100,000 highly skilled manufacturing workers. That’s less than 1 percent of the nation’s total manufacturing workforce and less than 8 percent of its highly skilled manufacturing workforce. “Right now, there are, for most jobs, enough skilled people,” said Harold L. Sirkin, a senior partner and managing director at Boston Consulting who coauthored the study. SUCH RESEARCH, however rigorous, has done little to quiet the concern about the skills gap. No wonder: Every few months, it seems, there is another sharp warning about it. 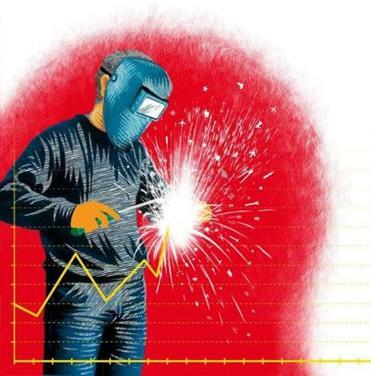 Consider a recent report commissioned by The Manufacturing Institute, an industry group, which said the nation had reached “an inflection point,” with the “viability and success” of American manufacturing and “the nation’s economic prosperity as a whole” on the line. “I can pull reports up from 10 years ago, from 20 years ago, from 35 years ago that say the same thing: ‘We’ve got a skills mismatch, we’re in dire shape,’ ” said Michael Handel, a sociologist who has consulted on labor market issues at the World Bank. Of course, the ruin predicted in the report never quite came to pass. But in recent years, a series of more restrained — and, perhaps, more compelling — arguments for a skills gap have emerged. Last year, for instance, the Brookings Institution reported that it took twice as long to fill science, technology, engineering, and math, or STEM, jobs as non-STEM posts. Meanwhile, academics like Alicia Sasser Modestino, an economics and public policy professor at Northeastern University, have focused attention on the middle-skills section of the labor market — nurses, teacher’s assistants, and computer support specialists. While Massachusetts is graduating plenty of students with the bachelor’s and graduate degrees required to do the most sophisticated work, Sasser Modestino says, it is not producing enough people with associate’s degrees or some college education. Even some skills gap skeptics lend credence to yet another argument, this one invoking that great force of modern American demography: the baby boom generation. IF THE SKILLS GAP is a vexing challenge to understand, it is also something of a Rorschach Test for the political class at both the state and national levels. From his perch at the State House, Charlie Baker sees a nuts-and-bolts management problem — just the sort of thing the former corporate executive believes he was elected to sort out. The effort also has the bipartisan patina that the blue state Republican favors. Democratic Governors Gina Raimondo of Rhode Island and Dannel Malloy of Connecticut have also declared concern about the skills gap. Indeed, while the two parties have split on some of the most controversial proposals for tackling income inequality — raising taxes on the wealthy, for instance, and increasing the minimum wage — they both see some advantage in talking up skills development. In South Carolina this summer, Hillary Rodham Clinton proposed a new tax credit for business to hire and train apprentices. “This is about building our economy from the bottom up, with people who have the skills and the drive and the work habits to really make the most of their own God-given potential,” she said. THE ARGUMENT for the skills gap has an intuitive feel to it. Its basic premise — that the economy is inexorably shifting to higher tech, more skilled work, and our schools are not keeping up — just sounds plausible. And survey after survey of CEOs declaring a skilled labor problem has only reinforced it. But critics insist there is a superficiality to those surveys. Ask any chief executive if he has trouble finding workers, and he will say yes. MIT labor economist Paul Osterman and then-doctoral candidate Andrew Weaver conducted a more detailed survey of manufacturers in 2012 and 2013 and found most were seeking basic skills: reading a simple manual, adding, subtracting, multiplying, and dividing. And while a substantial minority, 38 percent, sought more advanced math skills for their core manufacturing jobs, most cited disciplines offered at a decent high school — algebra, geometry, trigonometry. Weaver noted that employers, for the most part, are simply not demanding the high-level talents that the skills gap rhetoric would suggest. And policy makers err, he said, when they argue workers are falling behind. “The standard story that you hear a lot is ‘American workers just aren’t prepared for the 21st century . . . [they] just haven’t gotten the memo that they need to get a bunch more education,’ ” he said. The reality, he added, is that workers are, by and large, developing the skills they need to fill the available jobs. And when Osterman and Weaver asked managers the proof-in-the-pudding question — do you have any long-term vacancies? — more than three-quarters said no. Back at his humming Oxford factory, Kenneth Mandile reported no long-term vacancies of his own when the Globe visited. And after a lengthy chat in a small conference room off the factory floor, it was clear his story did not quite match the skills gap narrative. His difficulty finding workers who can operate the firm’s Swiss screw machines is not the result of some broad, new mismatch between 21st-century jobs and the skills of the workforce. It is, instead, a niche problem that goes back decades. These days, Mandile says, his chief concern is not technical skills; he can teach those in-house. It’s finding workers with a good attitude and a good work ethic. The problem, he suggests, is not mechanical, it’s cultural. And that may be harder to fix. • Are teen jobs becoming a luxury good? • Howard Axelrod: To be a college student, or not to be?